150 years after JEB Stuart's death, Patrick County still honors its native son. The markers pictured below can be seen at the Patrick County Courthouse in Stuart, Virginia. In the PatrickCounty courthouse lawn is a monument and plaque recognizing our famous Civil War General J. E. B. Stuart. 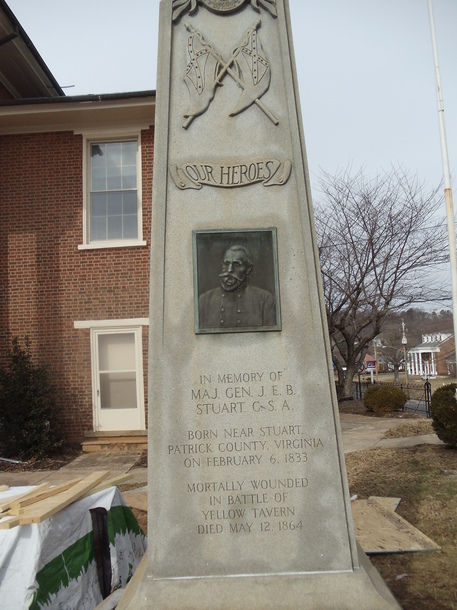 In memory of Maj. Gen. J. E. B. Stuart, CSA, born near Stuart on February 6, 1833. Mortally wounded in battle of Yellow Tavern. Died on May 12, 1864. 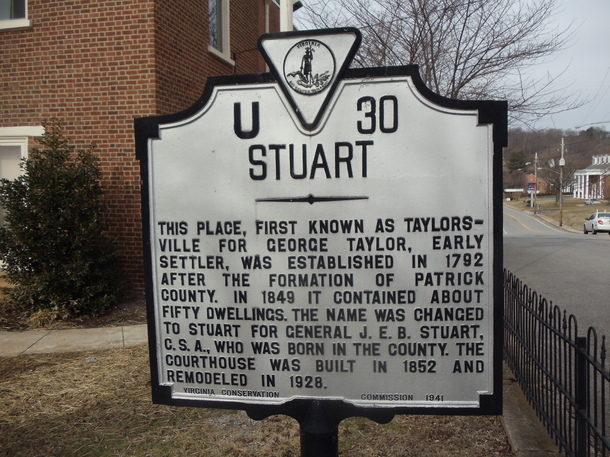 This place, first known as Taylorsville, named for George Taylor, early settler, was established in 1792 after the formation of PatrickCounty. In 1849 it contained about 50 dwellings. The name was changed to Stuart for General J. E. B. Stuart, CSA , who was born in the County. The courthouse was built in 1852 and was remodeled in 1928.